"Every week we will meet at a different location in the community and no activity is ever the same," explained Jennie Vessey, a local mom of two and director of Mommy Connections Saskatoon. "It’s a great chance for a child to be exposed to new and exciting activities while giving moms the opportunity to connect with others in the program." Some of the planned activities include a fire hall tour, an animal meet-and-greet at the Forestry Farm, LEGO-building, a karate demo and soccer. Each interactive session will be led by a local business, giving families the chance to sample local programs. Sessions will be held on Wednesday mornings from 10 to 11 a.m., Sept. 23 through Nov. 4 at various locations around Saskatoon. Registration is $90. Babies under 12 months are also welcome to attend at no extra cost. If you were not the lucky winner, you are still in luck! 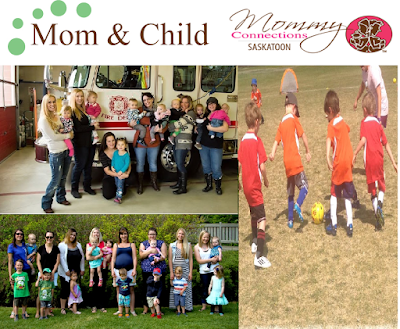 Everyone can save $25 on the fall 2015 Mom & Child Program with coupon code: "SaskMom"! Register online now at Mommy Connections Saskatoon. Something we look forward to in the fall is picking the apples off of Gma and Papa's tress to make apple sauce, apple crisp and cinnamon apple bread!! Congratulations, Amber! You have won this awesome Mommy Connections program, valued at $90. Please contact us at info@saskmom.com to arrange for your prize delivery.